I reached another step on my long road to becoming the Deli Devil. (If you have no idea what I am referring to, read my previous post: This Actually Happened – October 15th) Step eight: have some experience killing the same type of thing, repeatedly. In my case, I have been an insect serial killer for at least a quarter century; this is a step that I have plenty of experience with. I also have the natural ability to spot any insect regardless of the environment. I can spot a chameleon in the most inconspicuous hiding place. For some reason, I will instinctively stop watching television and spot a spider, hidden in the corner of my bedroom. Once I see an insect, the desire to kill it immediately washes over me. The problem is I have never been one of those people who touch insects, so I have to come up with creative ways to kill them without actually coming into contact with the critters. One major concern about moving to California was the knowledge that warmer climates produce larger and a wider selection of insects. Thankfully, I rarely come across the creepy crawlers. Unfortunately, insects are not yet extinct in the city of Los Angeles. Every so often, I will find an insect in the apartment and I will kill it as soon as possible. Since I do this regularly, I consider myself an insect serial killer. I even have a reliable instrument of death. MY TRUSTED BROOM! First, I use the broom to sweep the insect to the ground, if it is on the wall. Then I use the broom to sweep the insect into the wall at a high speed. The key is I feel absolutely no guilt! The result is quick and fatal. The insect dies and I use the dustpan to dispose the dead critter into the waste basket. Sometimes, I leave the insect on the floor for an hour or so, just to send a message to any other insects who may be thinking of entering the apartment. In a way, I am an evolutionary serial killer because I do it for the environment. In fact, the way I see it people who do not kill insects, found inside of their homes, are doing the planet a disservice. Charles Darwin’s Natural Selection will weed out the dumb insects and help to evolve a new super insect that will be smart enough to stay away from killer humans. Through the process of evolution, earth will be a place where humans and insects will be able to coexist, without having to interact. As long as you allow the dumb insects to continue living, you are slowing down the evolutionary process! Although there are people who believe centipedes are a helpful since they prey on other insects, I don’t want them anywhere around me. I have and always will hate centipedes. 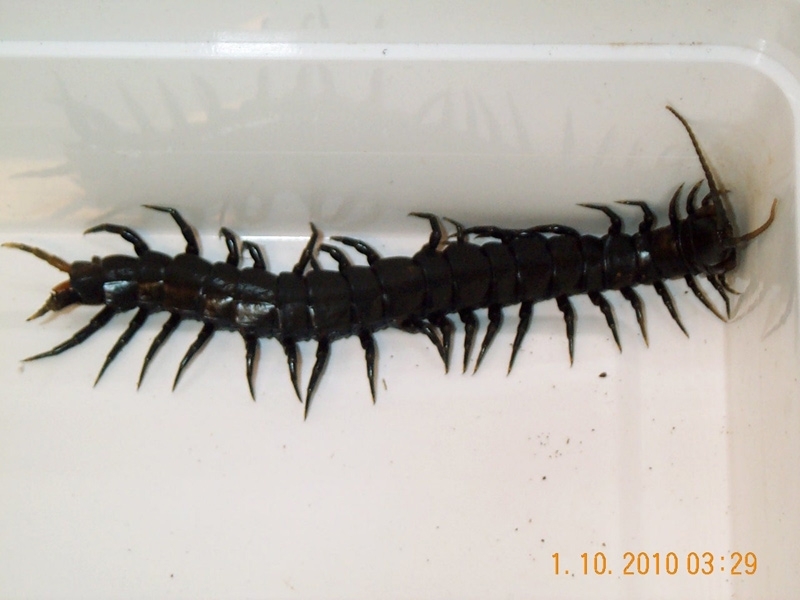 I will share too experiences which caused me to hate the centipede. Other than storage space, the basement of my childhood home was only used to wash clothes. Every time I went down to do laundry I had to be on centipede alert. It was terrifying. Originally, the basketball hoop in my backyard was located near the gate and we had problems with unwanted guests. At the end of the summer, we took down the hoop and planned to relocate it to a more desirable spot. When the spring arrived, a cousin of mine was helping me retrieve the hoop so we could re-cement it in the new location. As we carried the backboard up the stairs it got stuck and while we attempted to figure out the best way to loosen the hoop, my cousin spotted a large black centipede. My escape route was blocked by the hoop and I as stuck in the basement with the massive killer. I don’t remember much of what happened next, but somehow I managed to survive! It was a little wider and longer than this one! This post is sponsored by Orkin! This post is a cry for help. I don’t want to become a serial killer!